I began these corsets when I was asked to construct a medical corset using the shape of an existing corset that needed to be replaced with a new one. Although I have an extensive background in garment construction, I had never made a medical corset before, but I was up to the challenge! 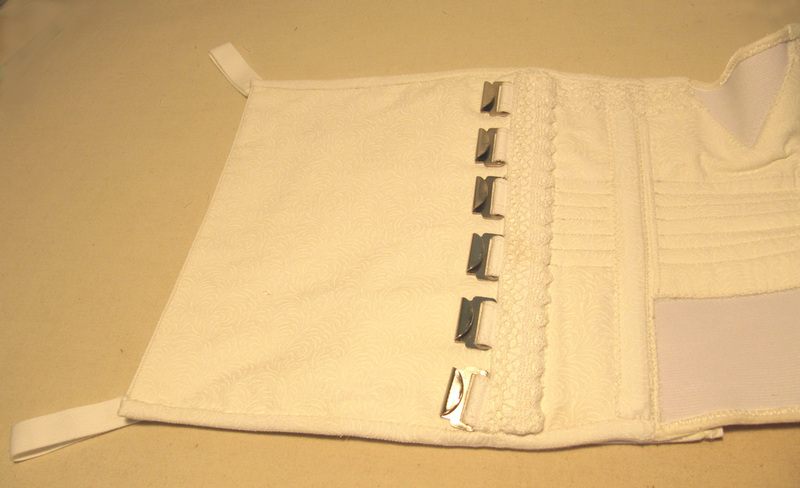 When Mary Lou showed me the corset, I thought - "Why do they have to be so bloody ugly?" I set about making a corset that fulfilled all of the medical requiements for support, as well as comfort, yet make it also look attractive. The photos below are the result of my efforts. Below is a note from Mary Lou. “I had polio as a kid and use a wheelchair. For me, one lingering aftermath of the disease is back, trunk, and abdominal weakness. In order to manage these problems, I have worn a corset to help me sit and breath comfortably. About a year ago, I was horrified to learn that the older Japanese women who had been making my custom-fitted corsets for many years had had a stroke and was retiring. I searched for a replacement in the San Francisco area, but the local medical supply shops only sold pre-made garments; none had the capacity for custom work. I complained to a friend about my problem and she mentioned that she knew a woman who taught fashion history and design and who is also a fabulous seamstress—perhaps she could help. That’s how I met the fabulous Barbara Beccio. After studying one of my old garments, which we had decided could be used as a pattern, not only she was undaunted by the prospect of making a new corset for me, she was eager to get to work on the project. The final product not only fits beautifully, it also is stunning! I had become accustomed to a strictly utilitarian garment that was fashioned after a model that had been designed by an orthopedist in the 1950’s. While it was functional, it looked exactly like those old-time ads you seen in archival newspaper and magazine collections. Barbara’s garment, however, is a work of art. It features decorative lace, hand-dyed trim, and custom grosgrain straps that are soft, yet functional. The detailed stitching is perfection. Any fashion gallery would be proud to feature this lovely item. 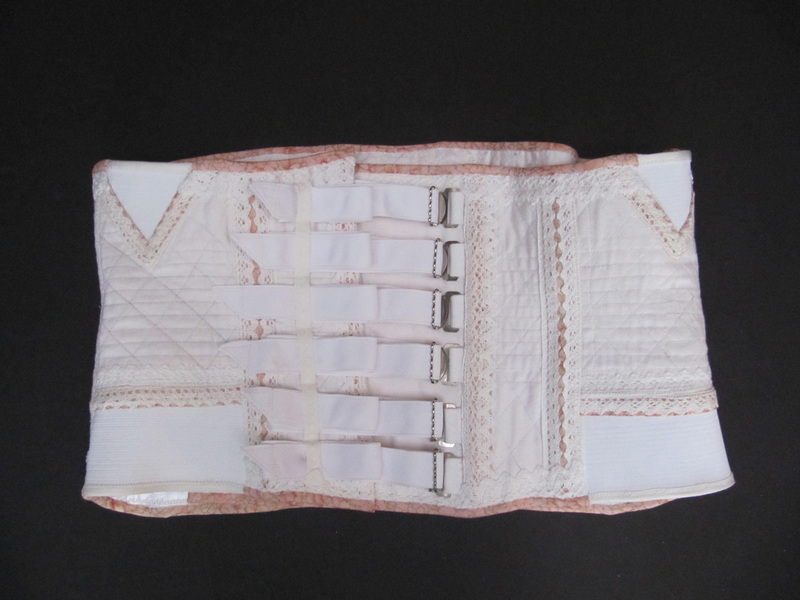 The corsets below are medical corsets that have been made to look fashionable as well as functional. This is the first prototype. 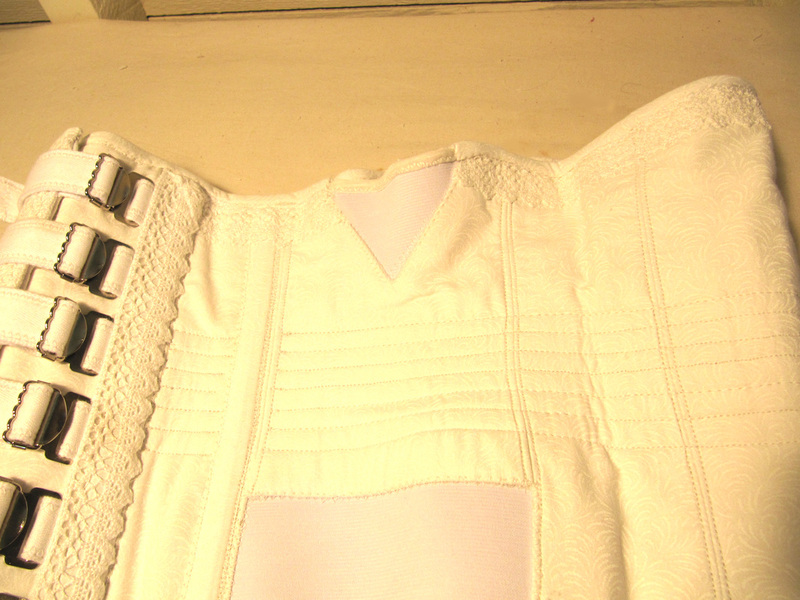 It was then altered for comfort and support and the two final corsets were completed. ​Below are photos of the second corset, where I added lace, and bias edges and boning covers in a floral fabric. As Mary Lou mentioned in her note, here is the batik corset! 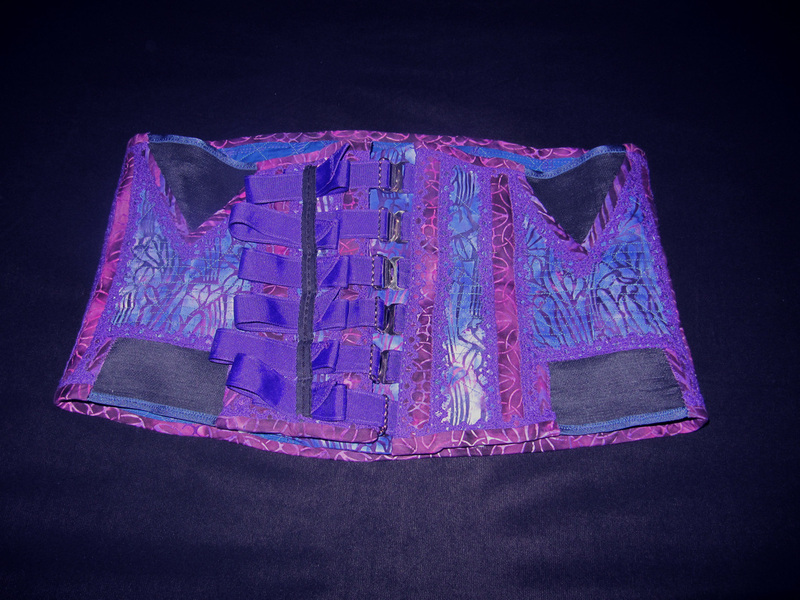 For this corset, I used 3 different batik fabrics, black elastic and purple lace. The inside fabric is purple as well! 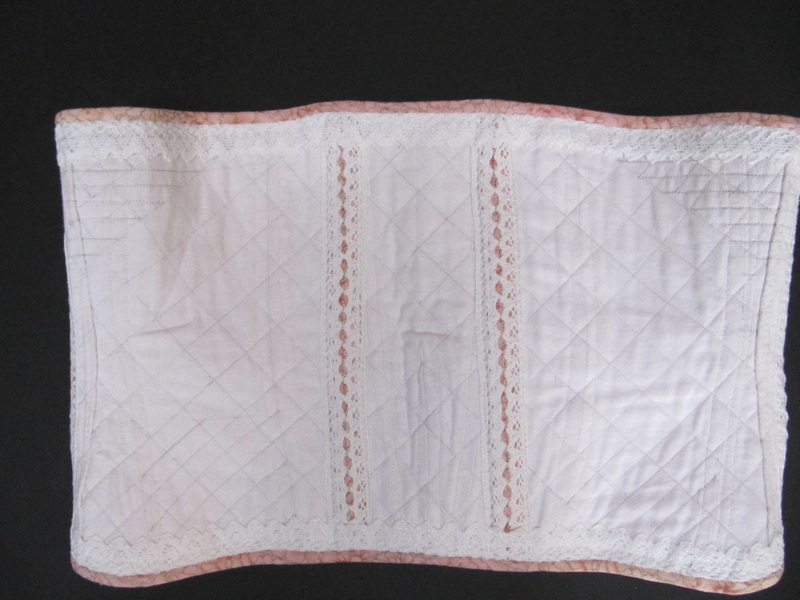 While working on the corsets, Mary Lou would want little changes for comfort and support and would jokingly say that she was like the "Princess and the Pea". When I made this corset, I could not resist putting a little green sequin "Pea" in the back of the corset!